We’ve just spent a week in La Rioja – for further education purposes of course! Being immersed in a wine region gives you such a great sense of the place. 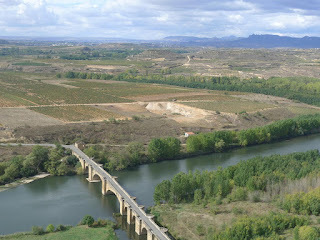 Our camp was literally minutes from the main bodegas of the Rioja Alta area, just outside Haro – the ‘capital’ of Rioja. We would ride our bikes around avoiding tractors and spilt grapes, breathing the aroma of fermenting grape juice. Being here in the middle of harvest was really exciting. Our 4 bodega tours were incredibly interesting and all so different, ranging from a very very traditional style of winemaking through to the mass production hi-tech of Marques de Riscal. At R. Lopez de Heridia, they are still making wine the same way they have been for 120 years, the only concession to the modern world is the use of tractor and truck rather than horse and cart. They even make their own barrels. This wine was the best we tasted. How they can achieve such an elegant wine with an uncontrolled fermentation and 70 year old barrels in beyond me! We saw wine being racked manually, oak fermenters being emptied by shovel, and ancient basket presses in action, right through to mass production bottling lines, doing 6000 bottles per hour!!! The town of Haro also boasts loads of excellent pintxo bars, so we didn’t miss San Sebastian too much. We took a bus to Bilbao one day as I wanted to see the Bilbao Guggenheim to add to my collection. The building is simply stunning, hard to imagine anyone conceiving of its design, let alone building it. Gaudi on hallucinogens?? Also designed by Frank Gehry, the winery hotel at Marques de Riscal is reminiscent of its big brother in Bilbao with the same titanium plate curves and waves. The gallery is definitely a case of form over substance as the collections were disappointing – I really don’t ‘get’ modern art! 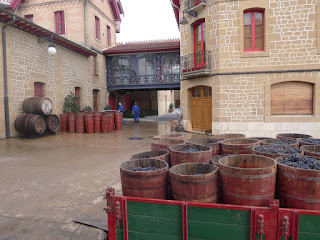 We also spent some rewarding hours in the local Dinastia Vivanco wine museum. Not being great museum people, we were surprised at how long we spent there, and how fascinating the exhibits. It was incredibly interesting and beautifully put together. 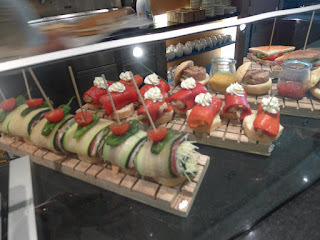 There was even a glass of wine to finish your visit! The last 2 nights saw us watching amazing thunderstorms and enduring very heavy rain, wondering how the growers would be feeling. Fortunately the days were dry enough and most of the harvest has been bought in. Time to move on – but with enough in the cupboard to see us through and remind of us of our time here.